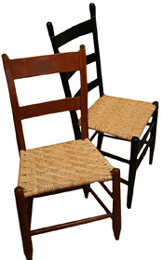 V. I. Reed & Cane, Inc. has been a seller of superior quality chair caning supplies and seat weaving supplies since 1981. Serving you online since 1996. Quick Shipping & Friendly Service. Founded by basket weaving teacher and designer Linda Hebert, its name later became V I Reed & Cane Inc.
V I Reed & Cane Inc. has its shipping facility in Omaha NE.